An aldehyde (RCHO) or alkanal is a carbonyl compound (compounds contain -CO- as a functional group) where carbonyl group is bonded to one carbon (or alkyl group) and one hydrogen atom. Ethanal is an example of aldheyde where one methyl group and one hydrogen group is added to the carbonyl carbon. But formaldehyde (HCHO) is an aldehyde where carbonyl carbon is attached with two hydrogen atoms. 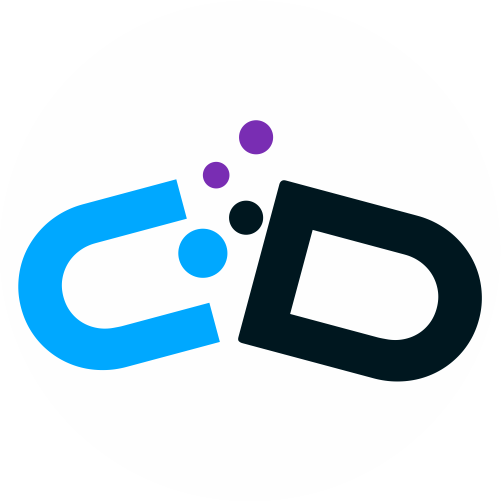 The carbon-oxygen double bond of aldehydes are composed of one sigma() and one pi (π) bond like the double bond of alkenes. The carbon and oxygen both are sp2 hybridized. 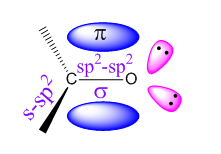 One σ bond is formed by the overlap of two sp2 hybrid orbitals carbon and oxygen. And the π bond is formed by the overlap of two unhybridized p orbitals of the two atoms. The other two sp2 hybrid orbitals of carbon are bonded with one hydrogen and one alkyl group (hydrogen for formaldehyde). And the unshared electron pairs occupy the other two sp2 hybrid orbitals of oxygen. The electron pairs shared by carbon and oxygen of the carbonyl group are not equally shared. They are pulled towards the more electronegative oxygen atom and thus slightly negatively charged. In common system aldehydes are named from the name of corresponding carboxylic acids by replacing the -ic acid with -aldehyde. For substituted aldehydes the position of substituents are designated as α, β, γ, etc. The carbon adjacent to carbonyl carbon is designated as α, the next one is β and so on. The most dominant technology to form aldehyde is by hydroformylation where formyl group (-CHO) and hydrogen are added to the carbon-carbon double bond. Here carbon monoxide and hydrogen are added to alkene to form aldehyde. Aldehydes are polar compounds because of the presence of carbonyl group. The electron pairs shared by carbon and oxygen in the carbonyl group are pulled towards the more electronegative oxygen atom and thus slightly negatively charged. 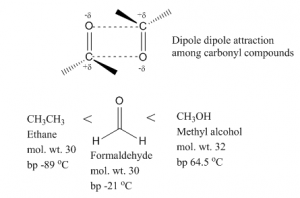 Due to this polarity, intermolecular dipole dipole attractions occur between the partial negative charge of carbonyl oxygen of one molecule and partial positive charge of carbonyl carbon of another molecule. Because of this dipole-dipole attractions, the boiling point of aldehydes are higher than the corresponding alkanes. On other hand, as this attraction is not as strong as hydrogen bonds, the boiling point is lower than corresponding alcohols. The small aldehydes are fairly soluble in water but the solubility falls with increasing carbon chain length. Although aldehydes can not attach themselves with intermolecular hydrogen bond, but they can make hydrogen bond with water molecules.The lone pair of oxygen in aldehyde molecule can make hydrogen bond with the partially positive hydrogen atom in water molecule. As increasing the carbon chain length, the hydrocarbon part of the aldehydes get in the way to form hydrogen bond between aldehyde and water. Thus the solubility decreases. Because of presence of partial positive charge at carbonyl carbon in aldehydes, these compounds undergo nucleophilic addition reacions. For example, the aldehyde and water undergo equilibrium reaction in presence of acid and base rapidly to form aldehyde hyrdrate. An aldehyde (RCHO) is a carbonyl compound where carbonyl group is bonded to one carbon (or alkyl group) and one hydrogen atom. The aldehydes are named from the name of corresponding longest carbon chain of aliphatic hydrocarbon containing the aldehyde group by replacing the ending -e with -al. The boiling point of aldehydes are higher than corresponding alkanes and lower than the corresponding alcohols. The small aldehydes are fairly soluble in water but the solubility falls with increasing carbon chain length. Because of the presence of partial positive charge at carbonyl carbon in aldehydes, these compounds undergo nucleophilic addition reacions.